One of our close friends, Tim deLacy, recently took ownership of a classic little sailboat. He got it from a retired co-worker and has spent the last couple of months cleaning it up and refinishing the woodwork. 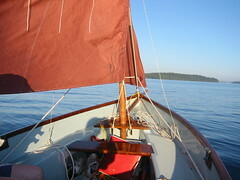 It is a gaff rigged ketch with red sails, called a Drascombe Dabber. They are popular in the UK and New England. Tim hasn't sailed much and wanted me to show him a few things. I wasn't much help in rigging the gaff sail, as I was unfamiliar with it. There was no wind as we set up but we had a slight breeze for about an hour, so we were able to sail it a little. It is a very pretty boat and I am sure that Tim will enjoy it for years to come. Texas Adventure - Day One - 1000 miles!